• Closed-foot version of the Reaction fins, the buckle-up version has met with full approval from divers. 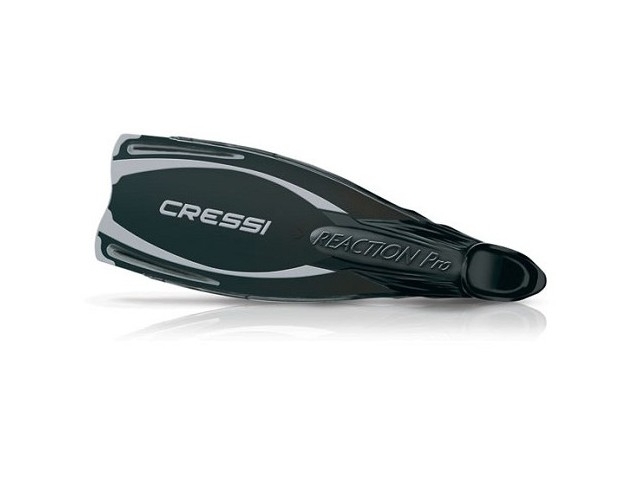 • The frame is moulded in three different materials, according to the Cressi patented system that guarantees surprisingly smooth and powerful kicking. • The blade is rather long, and has a differentiated thickness - thicker at the front end of the foot, it gets progressively thinner towards the end of the blade. • The wide-soled foot is very comfortable and outstandingly enveloping thanks to the extensive use of elastomers. • The soles are completely covered in thermo-rubber to give them an excellent grip on boat decks. • These fins have been designed not just for swimming and free-diving, but also for scuba diving, where they will surprise you with their fantastic performance. This Product was added to our catalogue on Saturday, 23. March 2013.